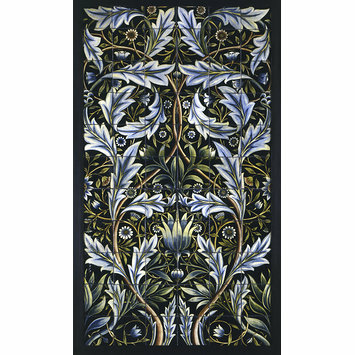 The architect of Membland Hall in Devon commissioned this sumptuous design for bathroom tiles from William Morris (1834-1896). Morris had the tiles painted in the studios of William de Morgan (1839-1917). They represent a rare collaboration between these two creative geniuses. Edward Charles Baring, 1st Baron Revelstoke, was the builder of Membland Hall. He was a merchant banker. The hall was later demolished. This panel is one of six surviviing from Membland Hall which was demolished in 1928. Morris & Co. were commissioned to decorate Membland Hall in Devon, by George Devey, architect to the banker E.C. Baring, Baron Revelstoke. The squared up pattern and one other panel is at the William Morris Gallery, Walthamstow, with a note indicating that it was intended for the bathroom. 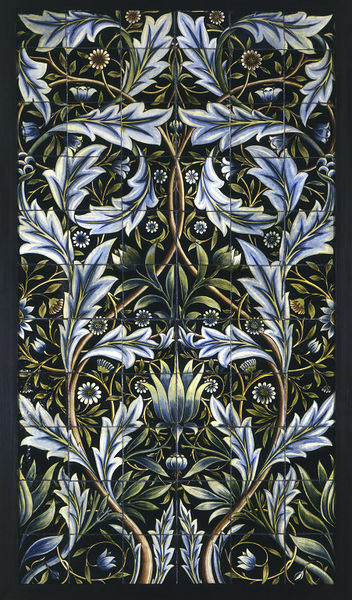 Historical significance: It is the only floral pattern for a tile panel on this scale by Morris. Presumably its ambitious size (of sixty-six individual tiles) and the need to produce a matching set suggested that he should turn to the better equipped De Morgan fo its production. The design remained on Morris & Co.'s stocklists until 1912-13 and a number of panels, other than the Membland six, are known to have been made. At least one uses De Morgan's own Fulham Pottery tiles. Far less particular than Morris, De Morgan supplemented his own production by using the Hamworthy tileworks (and other commercial manufacturers in Staffordshire and Shropshire) and the Carter & Co. pottery, also at Poole, to supply blanks for his own lustre- and colour-glaze wares. Tile panel, made up of 66 individual tiles, hand painted with a pattern of flowers and foliage. English, 1876. Parry, Linda (ed.). William Morris. London : Philip Wilson / Victoria and Abert Museum, 1996, p193. Design Cities: 1851-2008. London: Design Museum, 2008, P.16-17 ill., p.138. The blank tiles were bought in by De Morgan, from the Architectural Pottery, Poole, Dorset, and decorated at his Fulham factory.